Continuing our travel through Ireland Dottore Gianni and I spent a long day on the rails. 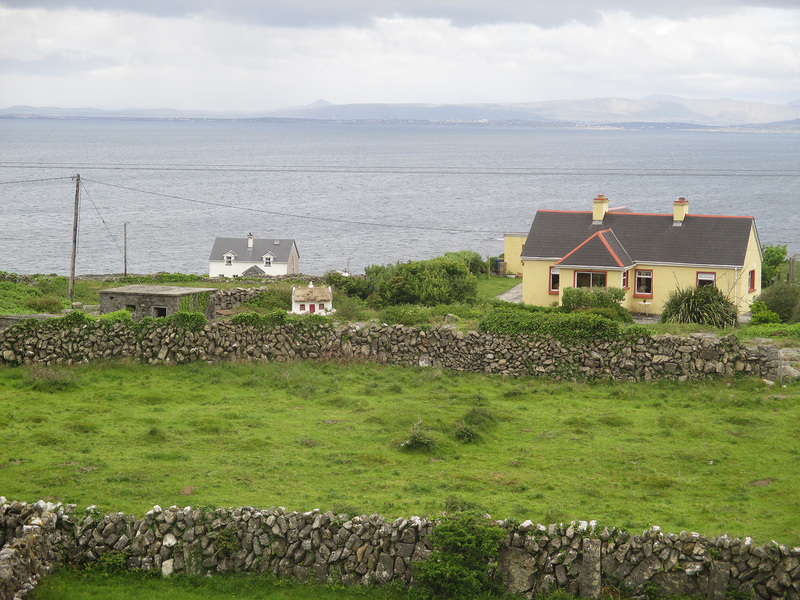 I was headed from Cork in the south to Galway in the west, but in order to accomplish that by train I had to take a 2 1/2 hour train ride back to Dublin from Cork, then catch another train in Dublin that put me in Galway a few hours later. 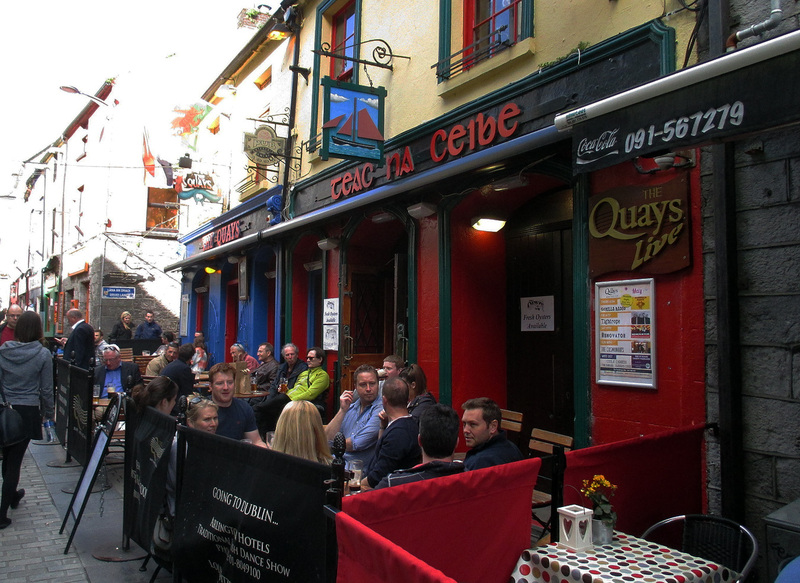 This still gave me time to enjoy the late afternoon and evening in Galway, my favorite large city in Ireland - and the next day one of my most exciting day tours - to Inishmore, largest of the three Aran Islands! Wednesday, 21 May 2014 was a travel day, as noted above. It was hardly tiring, but I did learn to appreciate the difference between first class rail travel (my trip from Dublin to Cork) with standard class, on both legs of the trip to Galway - more crowded, less comfortable. 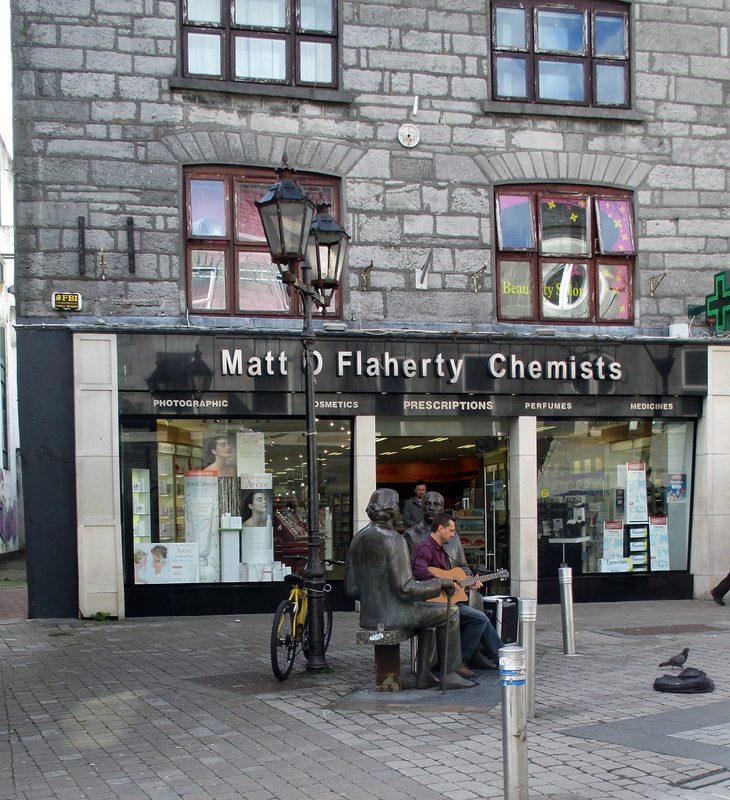 Once in Galway I grabbed a taxi from a pushy driver who wanted to take me on a private tour, arrange day trips for me, etc. He was surprised and grew quiet when I told him I had already booked all of the tours. But he got me to my hotel quickly. I learned that it was only a ten minute walk away, but all uphill, and I had two heavy bags. So I am just as glad I to have taken the cab, in spite of the cabbie. Not sure how to describe my room at St Jude's Lodge. Let's just say that if every room in the B&B was this bad I do not understand how it got great ratings. It was not so much small as TINY, but at least it was awful! There was one hard backed chair, but almost no room to sit in it - the view was of cars in the back parking area and three garbage cans, and worst of all it seemed to be in the process of re-modeling. The flooring in the entry way had been rooted up, there was unpainted drywall around the entry, and the lightswitch was dangling from the wall. The state of the room made me furious for a moment. It contrasted completely from the friendliness of the owners, twin brothers, so disconcertingly alike that I had no idea through the four days I spent there to whom I was speaking. 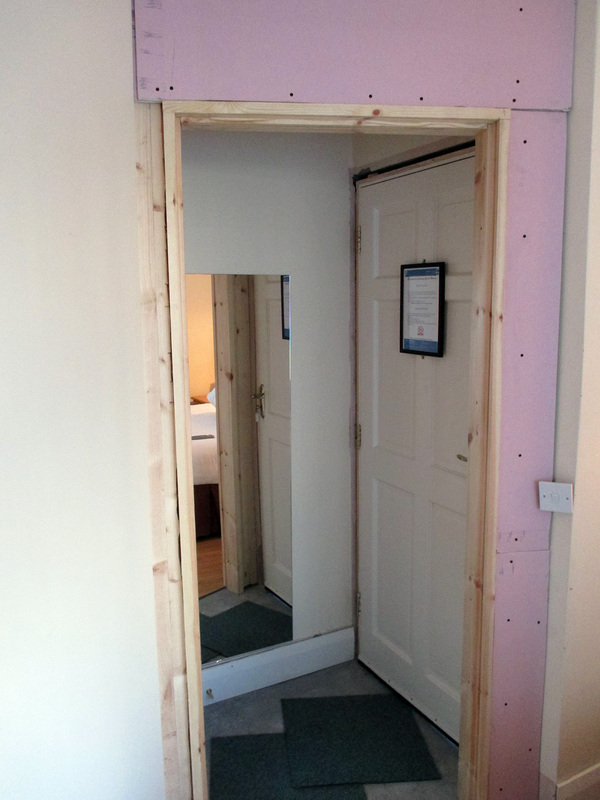 It was like a tale of two lodges - my room contrasted to the rest of it! My fury subsided quickly (though it will soon be unleashed in a review I am writing for TripAdvisor) as I realized that I would be in this room only to sleep and that the bed, the least comfortable of beds in the three hotels I had booked, would serve. 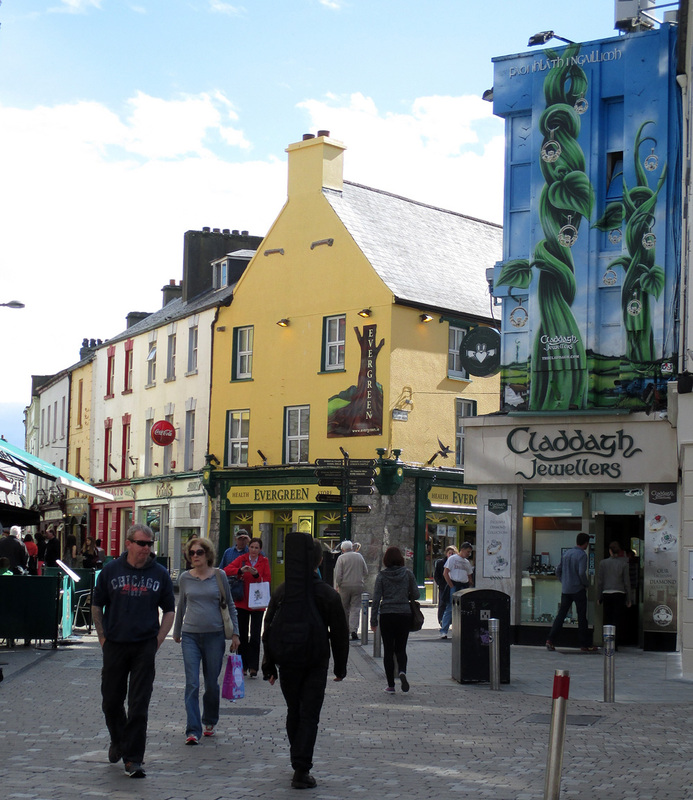 So I hung up a few shirts and a pair of pants, and plunged out on a very pretty afternoon to have a look at Galway. and never could get himself to care for Cork. My first clue that I might like it lay at the bottom of the hill from my B&B - a crazy looking joint called the Jungle Room - colorful and cool! And it took me only a few minutes, about the time I hit the pedestrian zone, to fall in love with it. 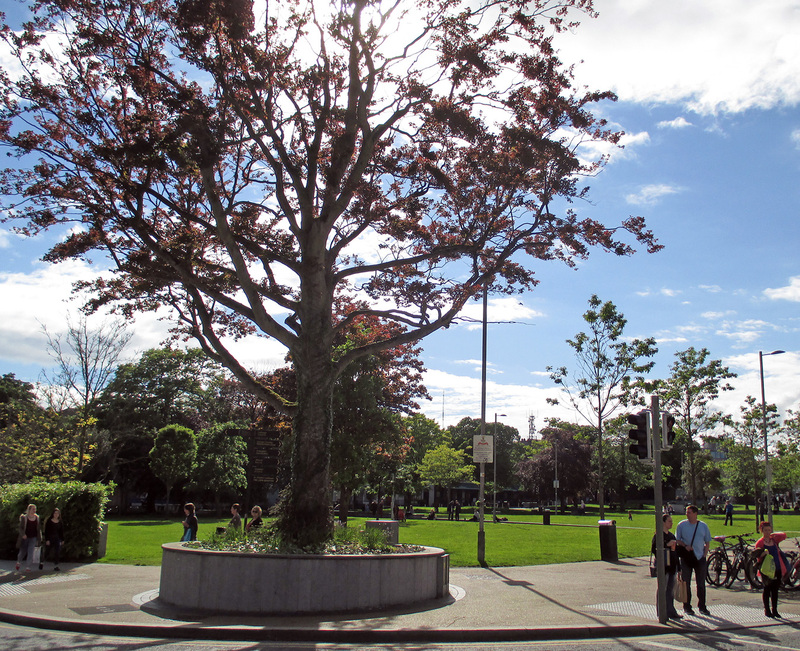 The zone sits at one edge of the central green space in town known as Eyre Square, a nice enough stretch of green, opposite the rail and bus stations which features a bandstand/speakers platform of sorts, and beyond that the bright flags of the fourteen "tribes" of Galway. If that sounds a bit barbaric it is, but only in the monetary sense, as these were fourteen wealthy merchant families who controlled the place in the Middle Ages. cross streets, some of which were pedestrianized as well, at least in part. 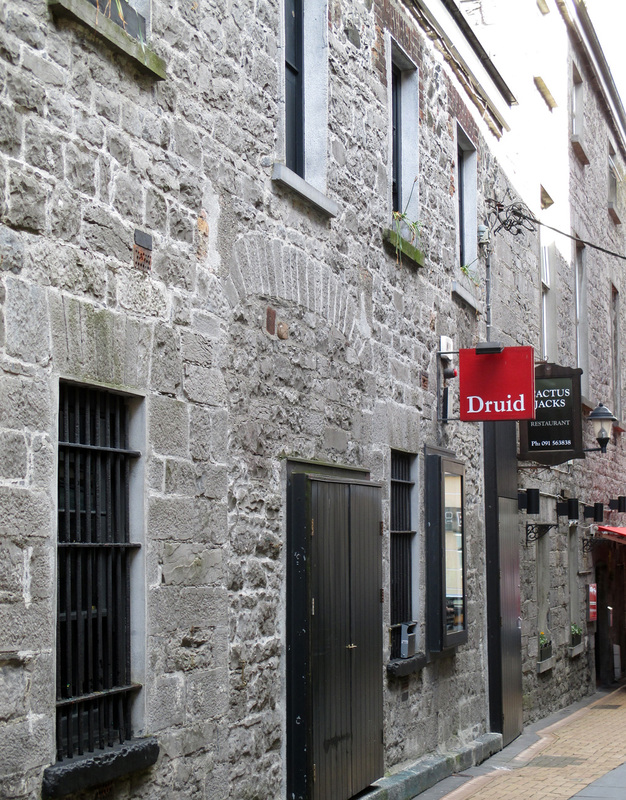 I knew that the famed Druid Lane Theatre was somewhere nearby, and spotted it easily - one of those side streets off the main strolling drag. I had done my research and knew that there was nothing showing there at the time of my visit, but this was not to be a trip with a theatrical focus. It was very nice, however, to see firsthand the place where director Garry Hynes directed smart productions of plays from the Irish Literary Renaissance along with nurturing recent playwrights, primarily Martin McDonagh. 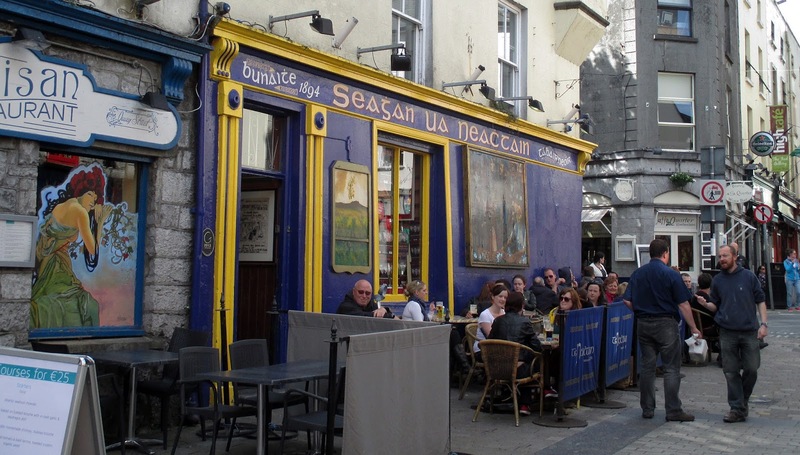 Tigh Neachtain - the hippest bar in Galway? 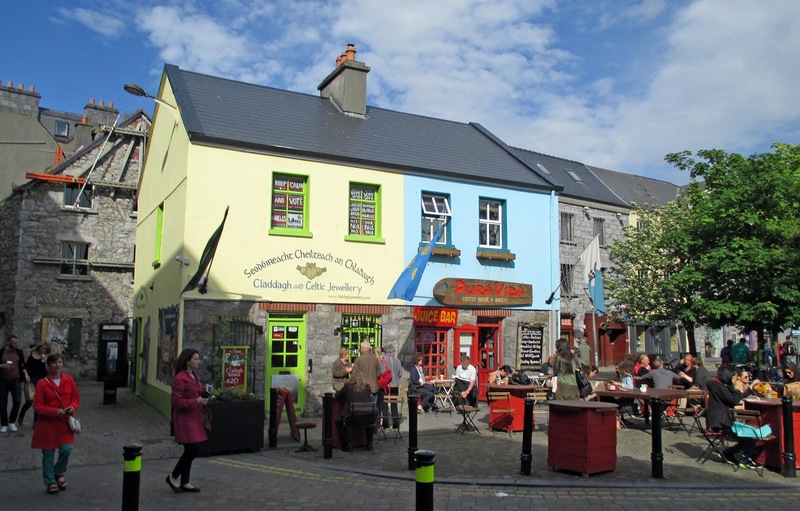 I strolled the entire length of the zone, peeping in momentarily at some of the tourist shops - this was the last part of my journey and I had to begin thinking about souvenirs etc - and one bar, the best known traditional pub in Galway (and there are a great many pubs in Galway, I assure you!) Tigh Neachtain (Naughton's - though you won't see that name on the door). I had planned to order a drink there, but first it was a labyrinth of nooks and crannies and at least two bars that I noticed, second nearly everyone in there looked twice as cool as I did, and most were speaking Gaelic. I thought that if I ordered everyone in the place would stop, turn and stare at me...for a moment - then go back to their drinks. We were, after all, in Ireland's wild west! 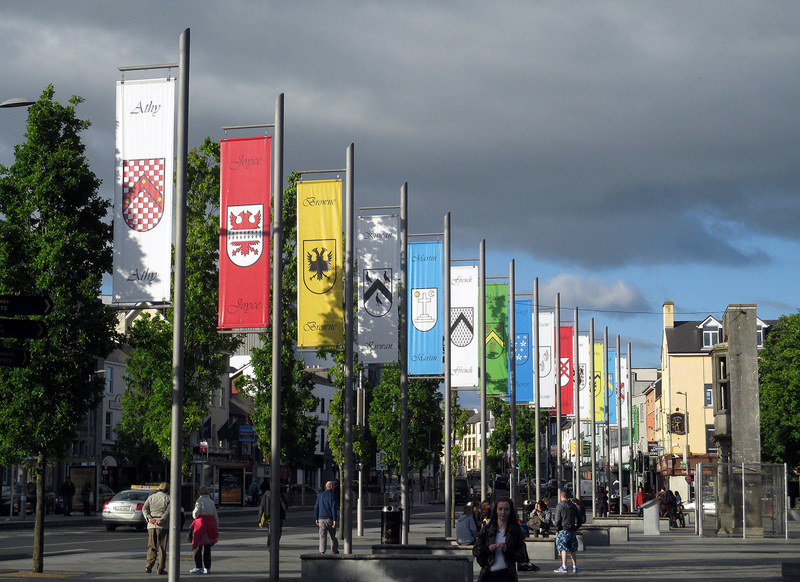 Sidebar on language: Galway is one of the areas in Ireland called Gaeltacht. That means that Gaelic or Irish is regarded as the primary language. The Irish language is dying, but as one poet, Dylan Thomas (Welsh, not Irish, but who's counting?) noted, it should "not go gentle into that good night." The youth of Ireland are strongly encouraged to learn Gaelic, in fact it is required in school in many areas. Dottore Gianni for one is a strong supporter that the Gaelic language not be allowed to die out, but knows that, as has happened with many local languages throughout the world, it is probably, sadly, just a matter of time. Lake Corrib, only a few kilometers north of Galway, but what it lacks in length it makes up in power. There are rapids right through the center of town. 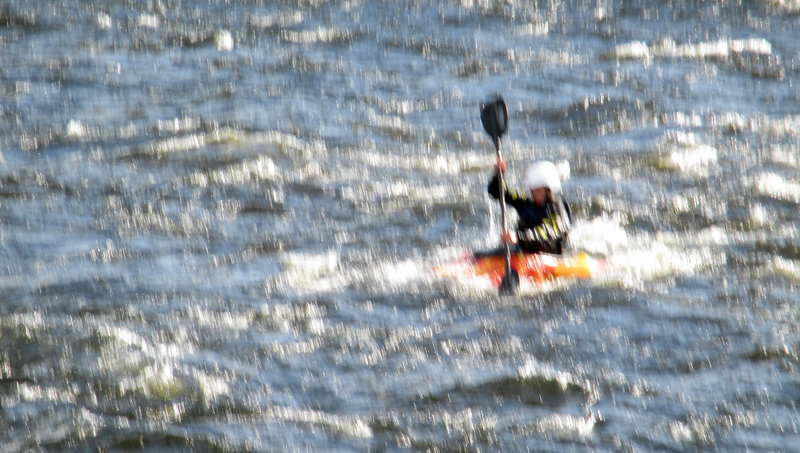 I watched a kayaker braving them - it's what I'd certainly call rough water, but that's why I call it dramatic! 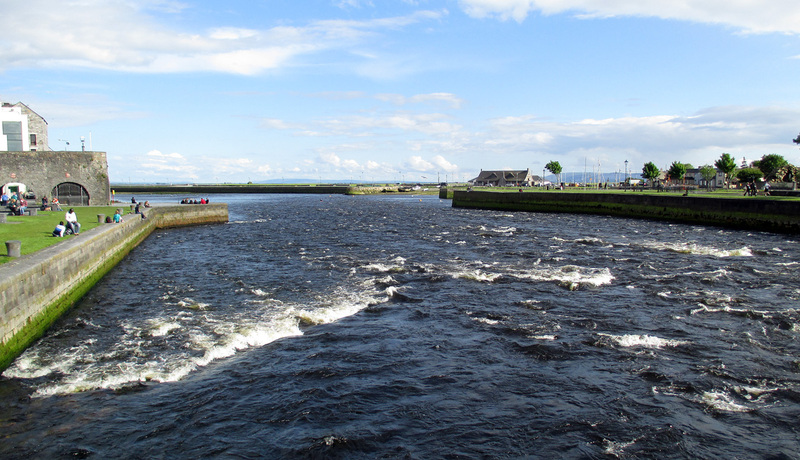 The river flows into Galway's great bay. There is a whole other section of town across the river, but I headed out towards the bay, fronted on by huge fields of green, used as athletic fields. at the bay's edge are benches where lovers, I imagine, sit admiring not only each other but the bay itself. And some of the playing fields along the bay - what a great green space! "Did'ya ever go across the sea to Ireland? and watch the sun come up on Galway Bay"
Galway Bay again - a bay of some size! And to watch the sun go down on Galway Bay." "come up" - "go down" - all the same, right? Hmmm...you can't win them all! There are I think three or four more verses, but that's all you get here! 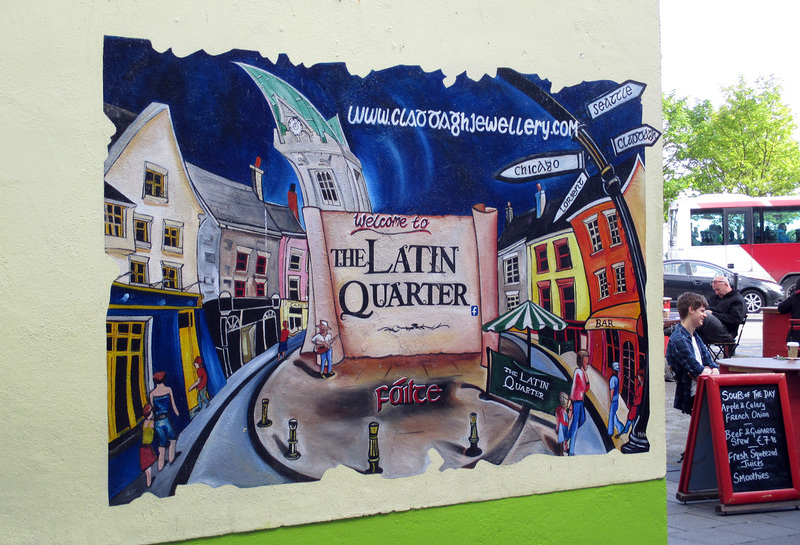 By the way, Claddagh is the oldest part of Galway, next to the river at that end of the pedestrian zone, though almost nothing exists of it today. All right, back to my walk! I could have strolled forever along the bay, but I had eaten very little on the train, and as it was now 6:30 pm already, decided to head back to the pedestrian zone and find something to eat. But I had been eating heavy meals each day, and wanted something light, so I saw a special at an Italian place, whose name I'm forgetting at the moment, and had a nice salad and a decent if hardly authentic Pizza Margherita, washed down with Montepulciano. Which ended up being a fairly heavy meal itself, but not Irish-heavy, right? 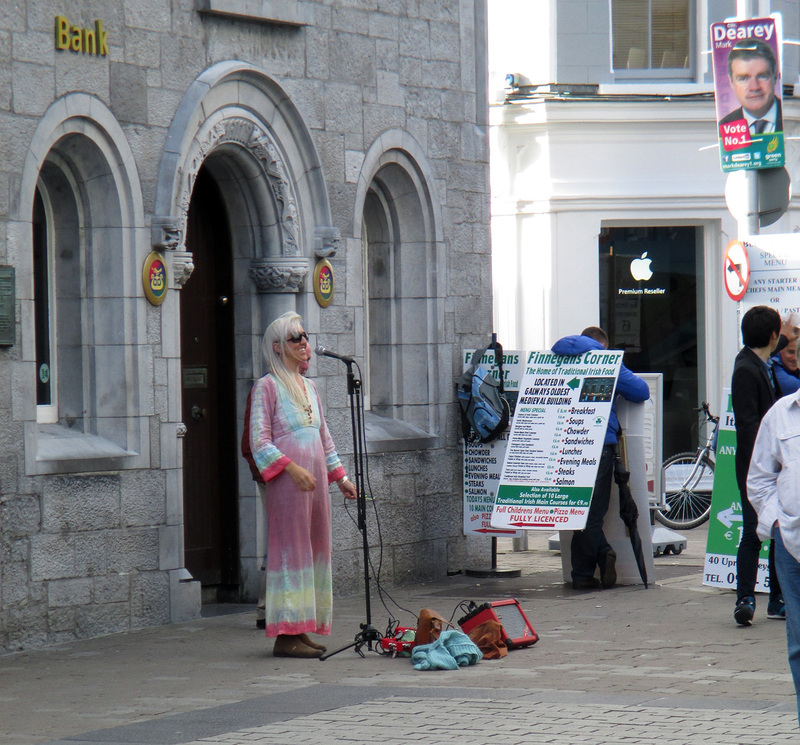 I strolled back along the pedestrian zone really enjoying myself and the city, getting a kick out of a middle-aged chick singing and swinging for her supper - she had one big voice on her! Near the hotel I stopped in at a grocery for a can of beer and some crisps, and et that in my ugly little room, then slept soundly. Thursday 22 May: I had to be out early today, so I had some toast and coffee - nothing else looked all that edible - at breakfast in my B&B - oh! For which they make you PAY! I have never been to a B&B (bed AND breakfast, right? Included in the price is the implication) that does not include breakfast - until now - 6 Euros - oi! Let's make that B-MINUS-B, shall we? I think I took an apple with me as well. 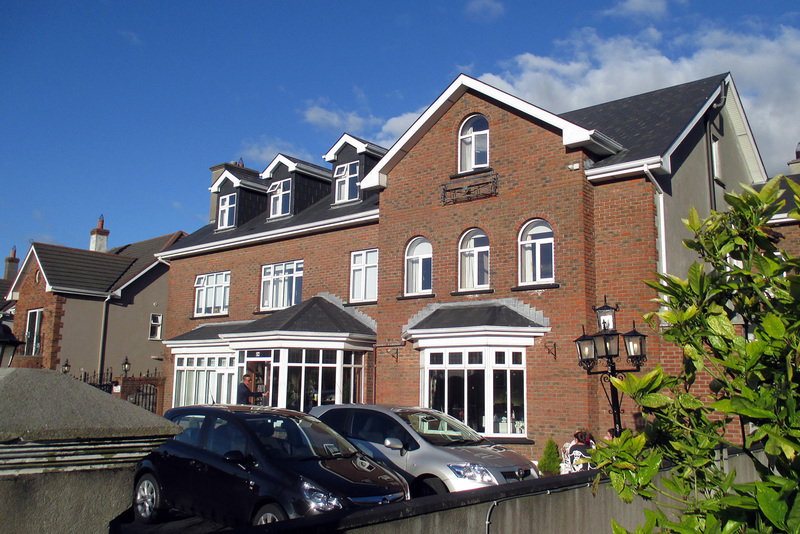 Ah well, St Jude's Lodge, what can I say? After breakfast I got out of there and walked a very short distance to the new coach station, just down the hill from my B-minus-B. 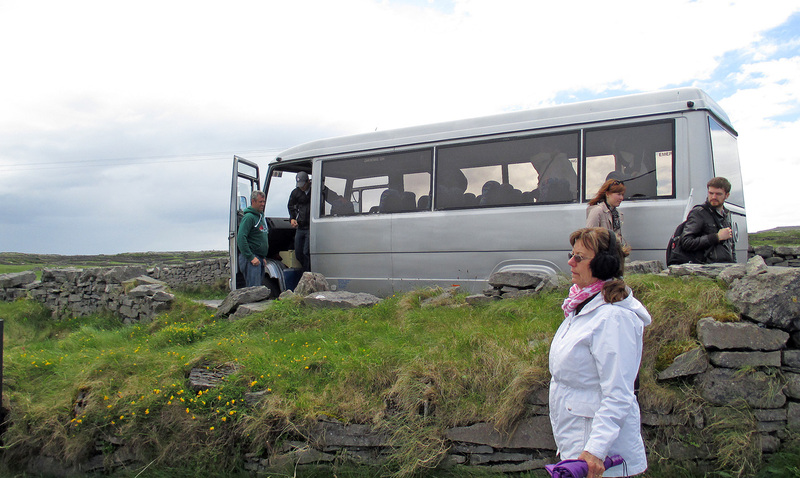 There I met Michael Faherty, the tour guide - this native of Inishmore takes people on this tour every day, has done for a long time. I found him fascinating, nice guy as well as great story-teller. I saw that several others had gathered as well, some of them purchasing their tickets at the time. This was the first day tour I booked, two months ahead of time - I confess I did micro-manage this trip. But I'm not at all sorry I did. Michael Faherty Tours is the only one I found on line that on which a fine tour guide drives the group in a good-sized van to the ferry, takes the ferry with the group, then gets the group into another van very like the first (the ferry takes people, not cars) and take you around the island, then brings you back. It was quite a day! Michael regaled us with stories and some orientation to the island. Unlike any of the other tour guides I had on this trip, when he had nothing to say he played good traditional Irish music, which certainly helped get me into the spirit (not that I needed any help, but Dottore Gianni...well, he sometimes takes some coaxing). but these stand, as the wind blows through them. 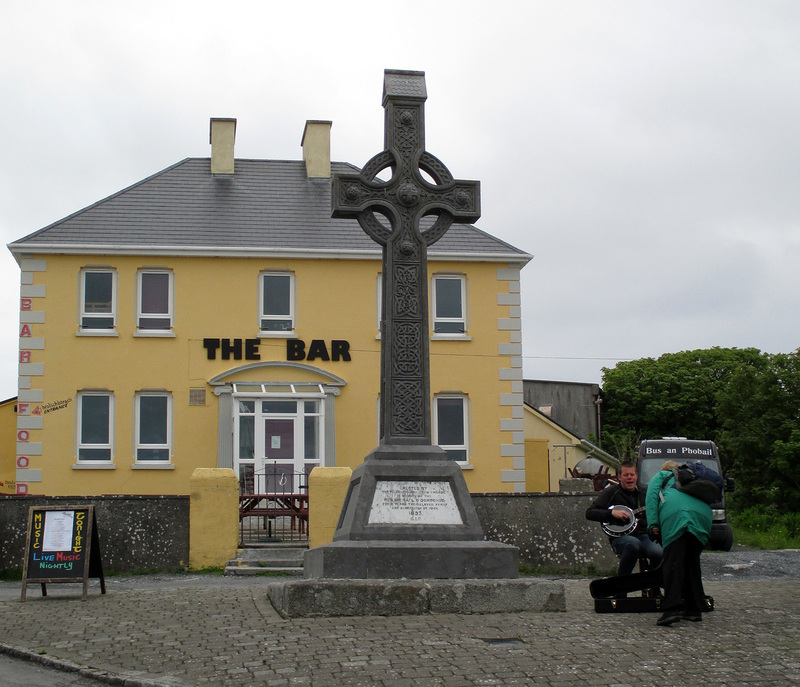 three may be visited, but Inishmore is the most tourist-trafficked. None of these isles are people friendly - weather changes in an instant and can be very rough, and the land is rocky and much of it is not conducive to growing your greens. 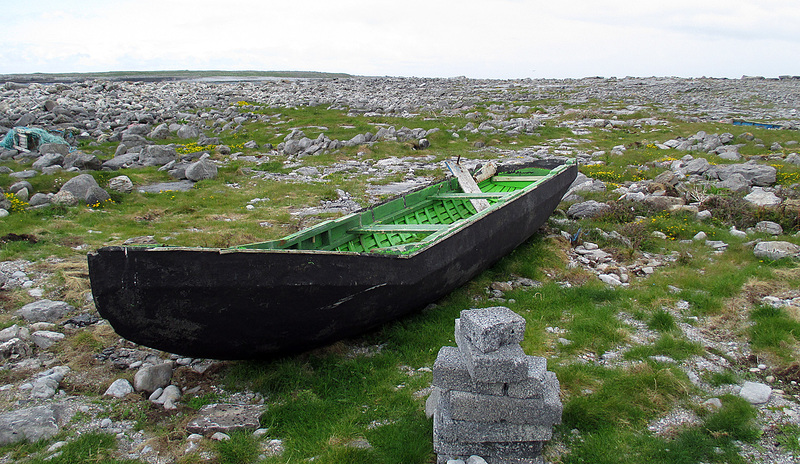 They are islands of seafarers, and as Michael told us in the van on the way to the ferry station, there is not a family living on Inishmore (the permanent population on the island is about 800) that has not lost one or more of its members to the sea. One of the great early documentary films, The Man of Aran, 1934 I think, makes the roughness of life and the relationship with the sea vividly clear. The ferry over was packed with people. I was very lucky that I found a seat, as we were some of the last to board. 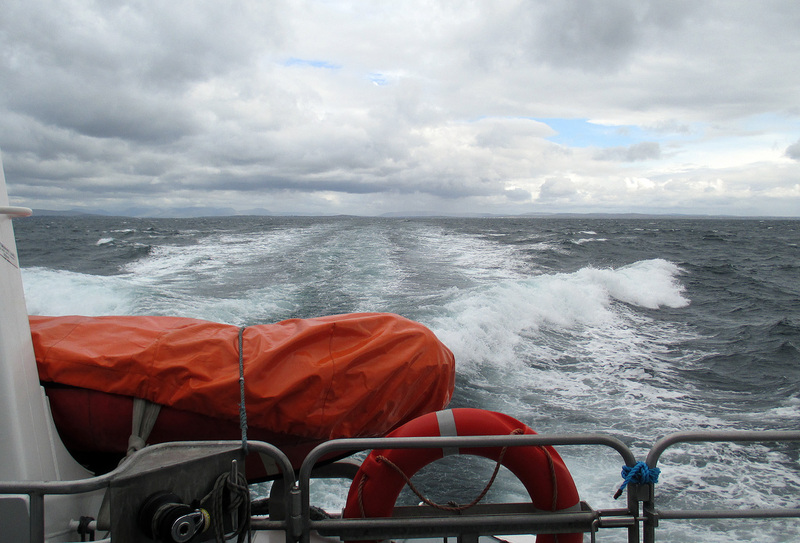 We left from Rossaveal, as it is the port closest to Inishmore, and I was happy for that, as I am never comfortable on the sea, and these ferries were not the most comfortable, also very easily rocked by the waves. I was very glad for the 45 minute trip to end, and poor Dottore Gianni was a nervous wreck! It started raining lightly as we departed the ferry, but Michael's van was not far away and we were off, on some of the tiniest roads I could imagine. As Michael told us, all is usually well, until two tour vans try to pass one another on a curve. There was a large group of students (I think from the Netherlands?) bicycling through the island, but you couldn't have got me to do that for anything. The roads were far from smooth, they are very hilly, the weather works against you (rainy and often very windy) and...well, there's the vans and cars that cyclists must "share the road" with. 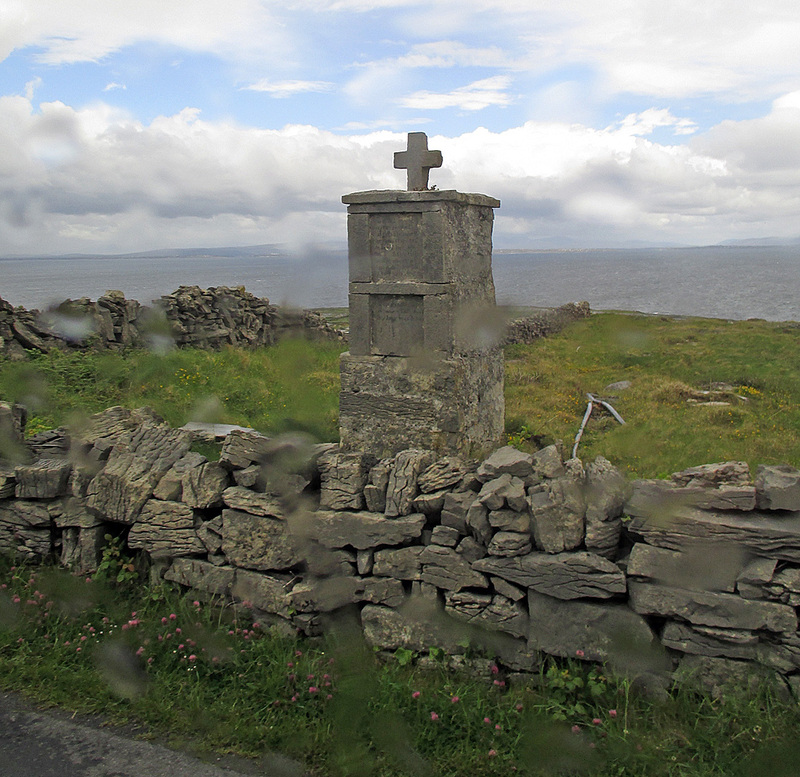 On our way to the first stop of our itinerary we passed several Celtic crosses at different points along the roadside. Michael pointed to one and said that you'll see these dotting the land, as they are memorials to those lost at sea. He repeated what he'd said about every family losing some, then after a pause told us that in his own family, two of his generation had been lost. Interestingly he himself had been a commercial fisherman for ten years, but had finally given it up and invented this tour. Glad he did. Who lives in the tiny house? 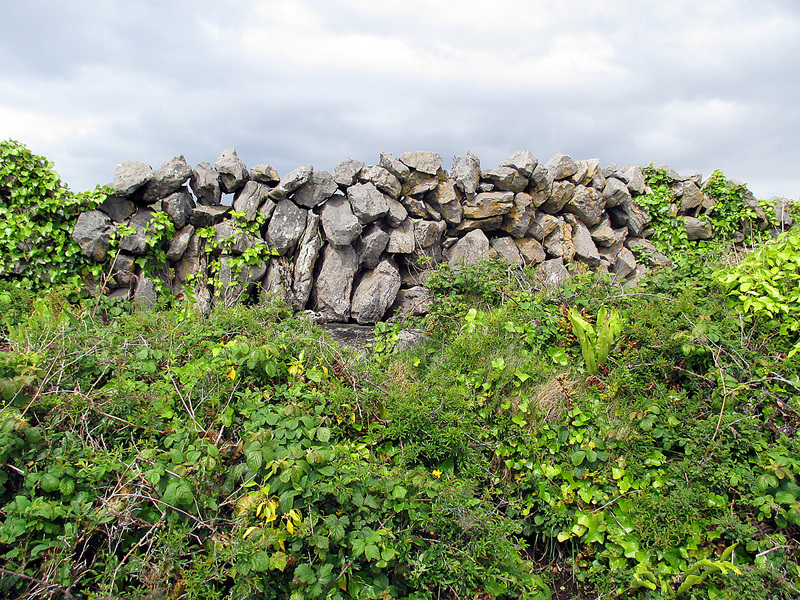 See just below - and more stone walls - you've got to do something with all them bleedin' stones! On a lighter note, he also pointed out a house on a hillside overlooking the sea, a tiny house built in the same style just next to it, and said, "Ya know who lives in the small one, don't ya?" Pause for effect, then, "Leprechauns!" 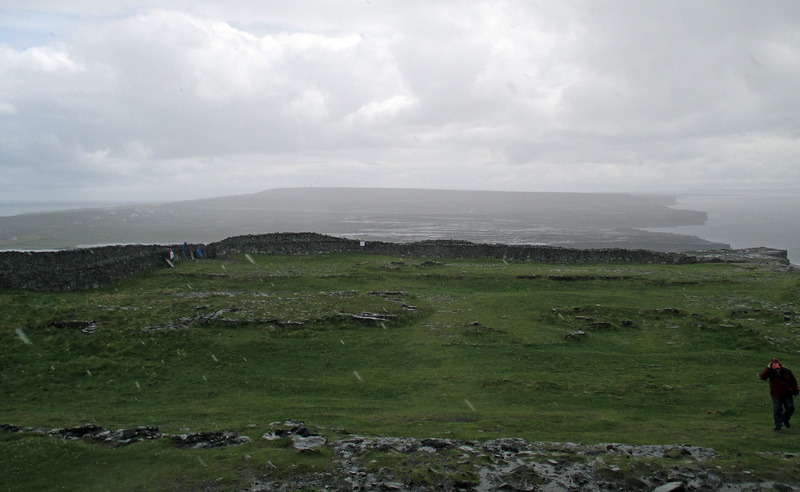 The approach to Dun Aengus - and the fortress itself at the top - weather looks OK, yes? 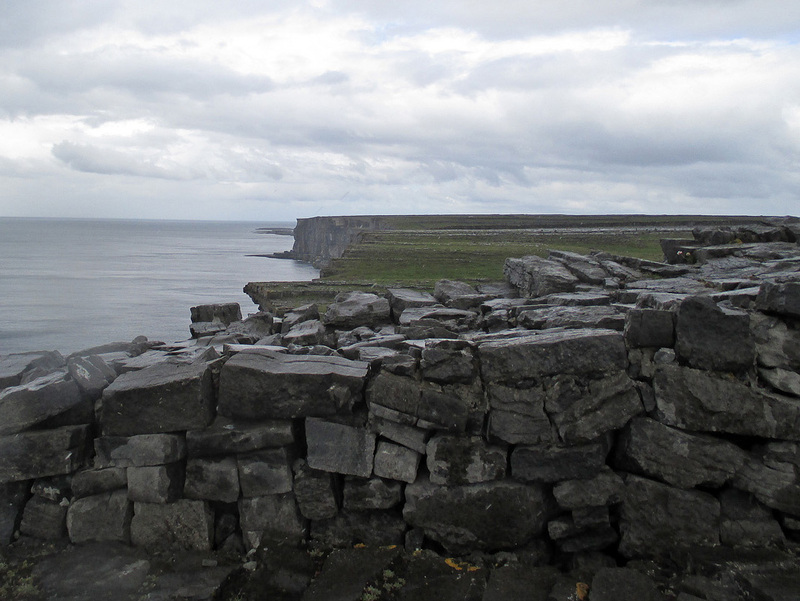 Our first stop was probably the most important, an ancient fort called Dún Aonghasa (anglicized Dun Aengus), perched high atop cliffs that look down on the sea. 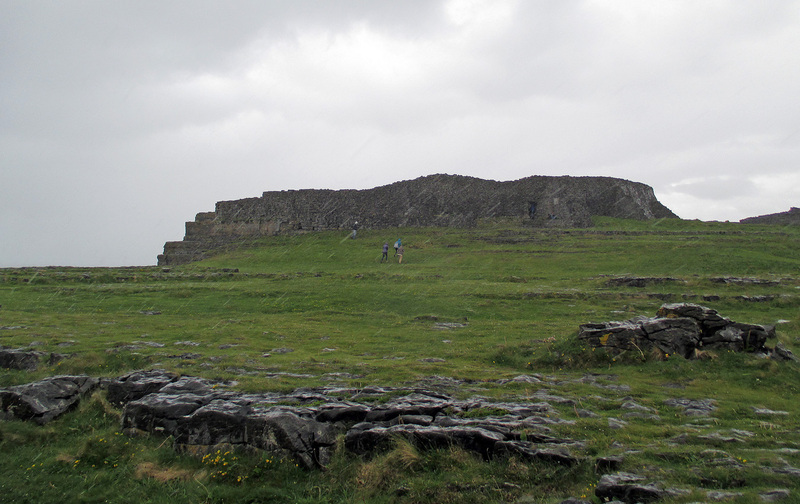 The earliest structures in the fortress date to 1100 BC, though much was added to it in 500 AD. the ferry, the ferry ride itself and driving part of the way across the island, it was midday. We parked in a small car-park, nearly surrounded by tourist shops and a small restaurant, which Michael highly recommended. A bit farther down the road was the was the entryway to the fort, a small visitor center with its own cafe attached, and a few more tourist shops. I was one of the very first of our group through the tourist center, paying the cashier and charging out and up, as I was really excited to see not just the fortress but the views from it. As I got closer to the fort it began to rain - if you look close you can see the rain, on diagonals from right to left - you can't call those "drops!" another) the weather seemed quite nice - the rain had stopped and the sun was peeking through clouds occasionally. But by the time I got near the entrance to the fort itself it had begun to rain again, and the wind began to blow. Once in the fort, no place to hide really, the rain and wind both became more intense and I was being pelted by raindrops driven by wind, and possibly a bit of hail or sleet. I had a poncho in my bag and got it on, but whatever was not covered by it quickly became soaked. I was undeterred, however. How often does one get to see such a site? For me, once only, surely. 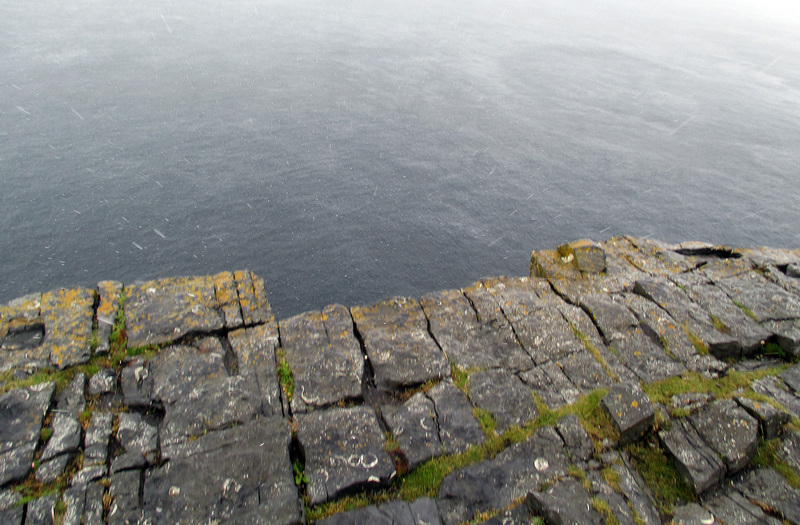 So I stalked my way around Dun Aengus, taking photos of the cliffs on either side, photos that were flecked with rain drops on the lens, alas, but documentary evidence of my drenched time there. Certainly the rain shortened my visit, and that's too bad, because I didn't get to see as much of it as I'd hoped, including the chevaux de frise (large stones made to stand on end so as to make it difficult for attackers) on the west side of the fort. But I got back down, careful not to slip on the rocks at the beginning of the descent (though I managed to anyway, but for a change maintained my balance), and made my way to the restaurant recommended by Michael. There was not much of a line there and I saw exactly what I wanted - Guinness beef stew. This was delicious, magnificent. 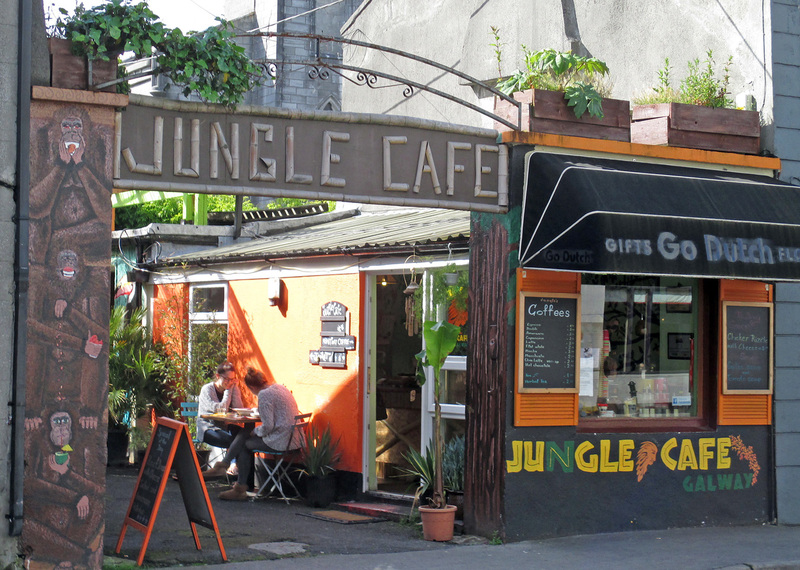 I've had the dish many times before, in England and Ireland, but none have come close to the flavor of this stew, that I was eating, drenched, in a tiny cafe run by two sisters from the island. I spoke to one of them, praising her stew and she thanked me very sweetly, gave me one of their cards, and ended - "You know, don't ya, that we're on TripAdvisor?" I promised her a rave review and delivered on the promise. 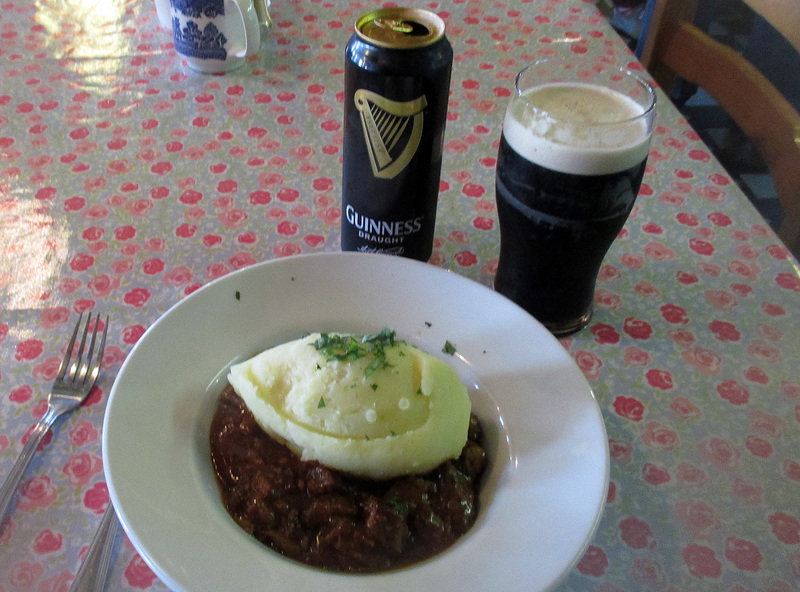 The best Guinness beef stew I've ever had, topped by a generous dollop of mashed potatoes and of course a Guinness to go with! Sidebar: Call it the theatrical in Dottore Gianni (of which there is more than enough, believe me) but these two sisters could have been, to his mind, and to my own, the very sisters that ran the shop in Martin McDonagh's great play The Cripple of Inishmaan - but of course I was on the wrong Aran isle for that! And even though he did write The Lieutenant of Inishmore, a play so darkly terrifying that it manages to be extremely funny at the same time, fortunately the few people I met on Inishmore were much more pleasant than any of McDonagh's characters! I also, and maybe even more so, could not get out of my mind John Millington Synge, who wrote a book about the islands, but who also wrote a powerful play, Riders to the Sea, about the deaths of some fishermen at sea and the effect on their families - I haven't looked at it or researched it for a long time, but if it wasn't set on Inishmore it should have been! As I slowly dried out and drank my Guinness (what else to partner with a Guinness beef stew?) I felt very happy. 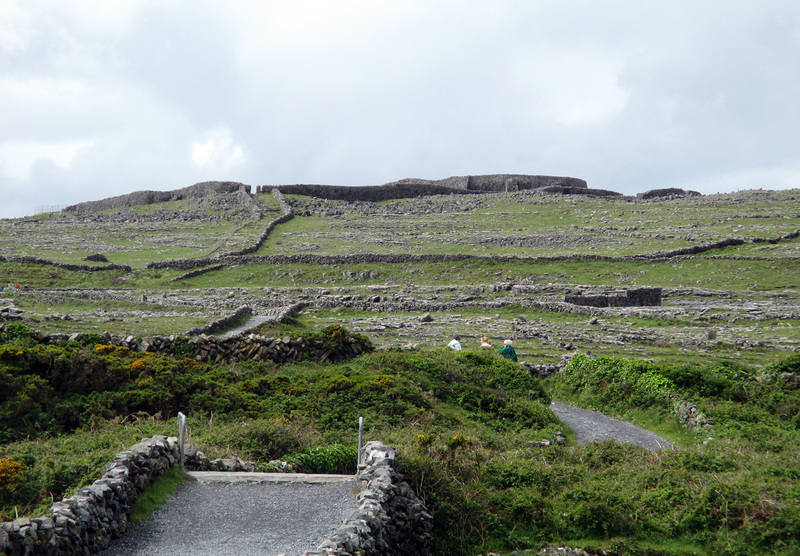 The rocky fields of Inishmore did not offer the kind of beauty I had seen at Glendalough or Dingle. But in a rough, elemental way, and even in the wind and rain (I had actually thought during my time at the fortress of Lear's famous line: "Blow winds, and crack your cheeks! Rain, blow you cataracts and hurricanoes!") 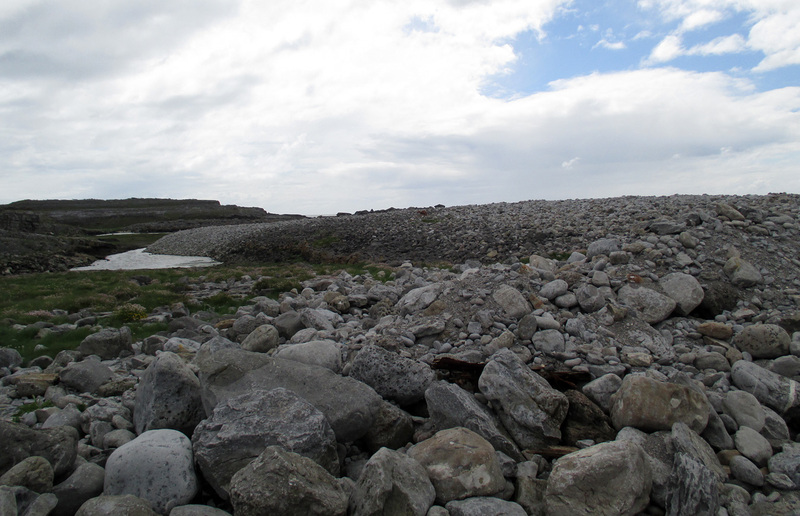 Inishmore was every bit as amazing. BLOW, winds, and crack yer effin' cheeks! We had time to look in on the shops. 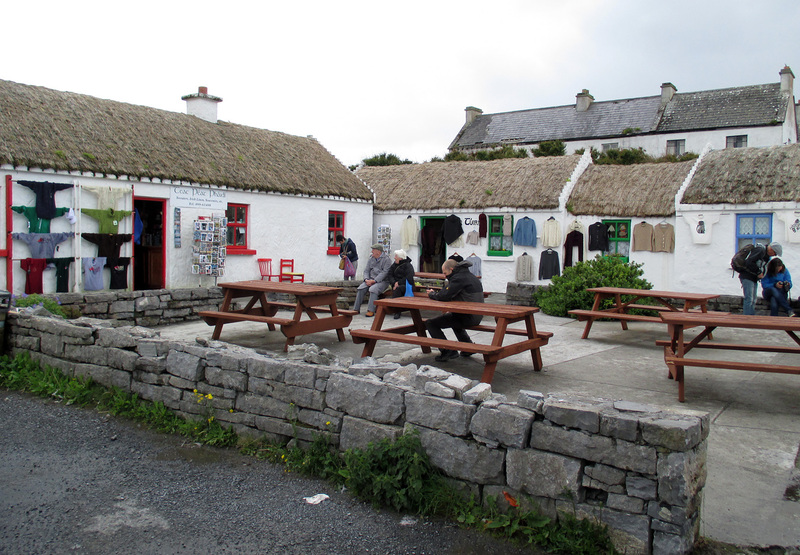 I must tell you that I would LOVE to own a hand-knit sweater from the Aran Islands, but you pay through the nose for a beautiful and literal handiwork. Nothing under 100 Euros, and much as I'd have liked to, I just couldn't afford one. I DID afford a t-shirt, however, light green with a simple "Aran Islands" written in dark green, worn over my heart, and a trinity cross imprinted above it...above the name, not my heart...that might have hurt, and Dottore Gianni is not fond of pain! On then on to our next stop, a place called Seven Churches. the other 5 ruins are outbuildings, where the monks that founded them lived. 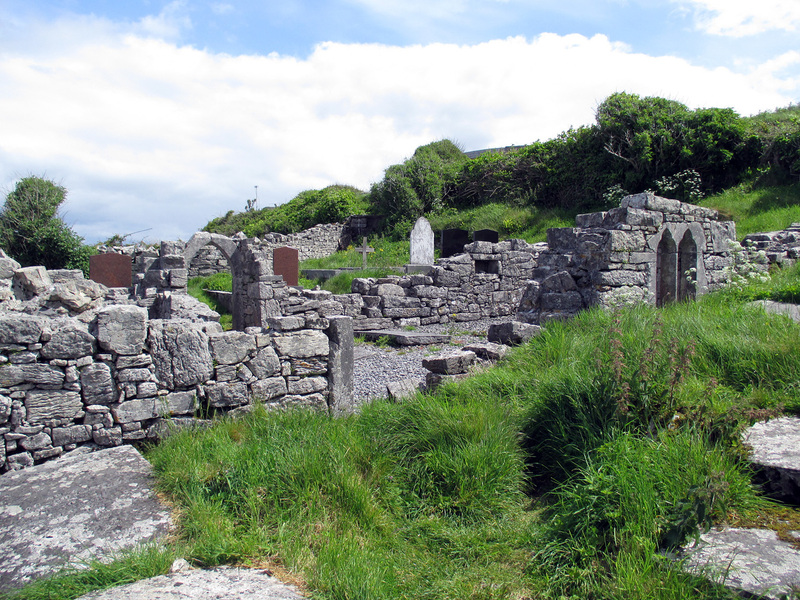 Tempeall Bhreaghain, the older of the two churches, dates to the eighth century and was built by followers of the site's founder, St Breacan, or Brendan as we non-Gaelic speakers would know him (if we knew any saints). 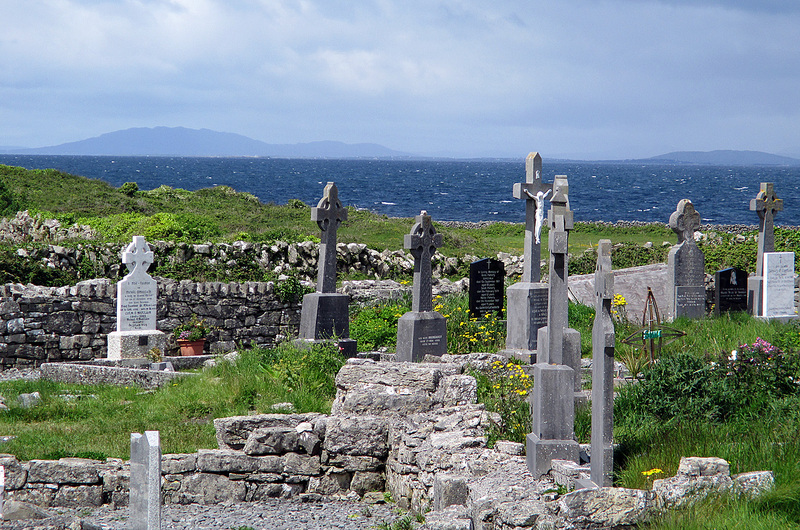 In fact St Brendan is buried on the grounds. 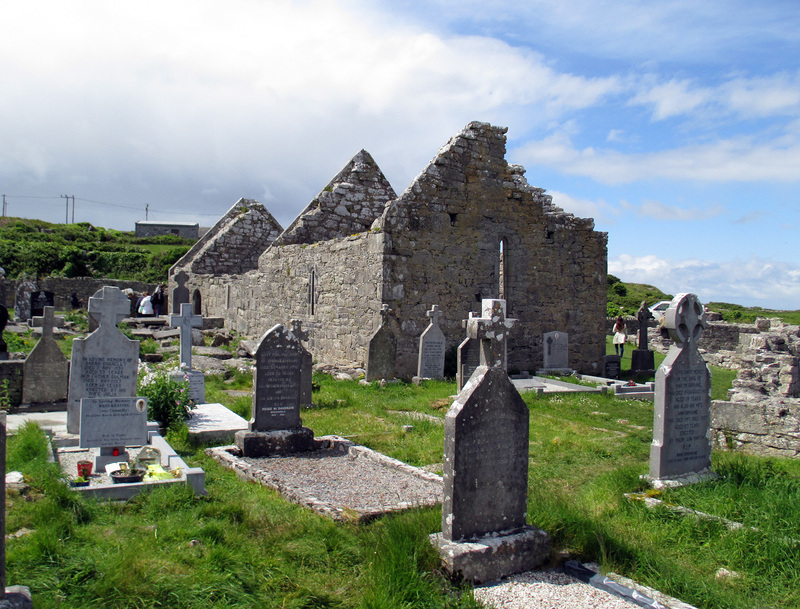 The smaller of the two churches is more recent, built in the fifteenth century. I found this place interesting, but Michael didn't have a lot to say about it, and none of the sources I'm looking at now have much more to say about the site either. It's only a short walk to the sea from Seven Churches, along he coastal road, which up until a few months ago made a turn at the seaside. But a savage storm destroyed that curve and the road is now out of commission. 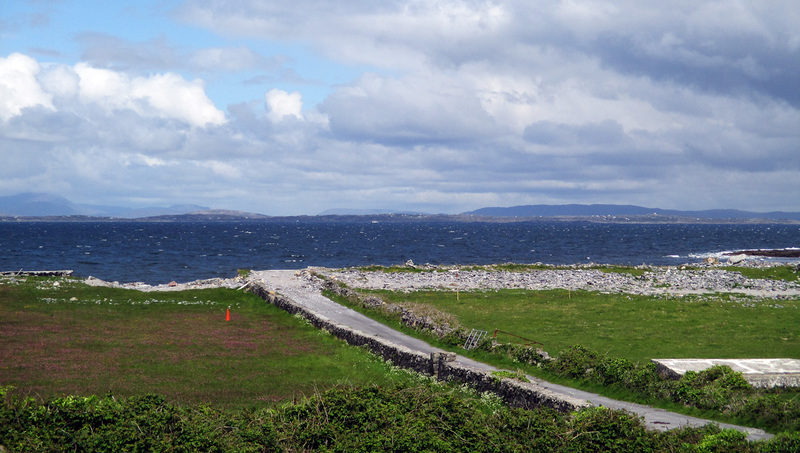 On the left of the road leading to the sea is a Gaelic Football field - not too many people, even houses, around so I wonder who plays on it, but that is a much-loved sport in Ireland, along with one unpleasantly named Hurling. Not sure what is hurled or how, but...well, as noted...sounds unpleasant, at least to Dottore Gianni! The road down to the sea from Seven Churches - the road should turn right - and it did until a few months ago - the pile of rubble on the right is what used to be the road - the sea is a powerful force! 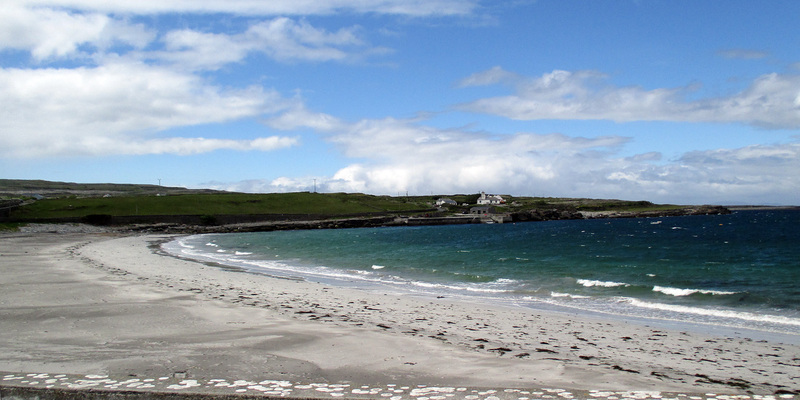 be called a beach, as the area is a bleak place, filled with big gray rocks. 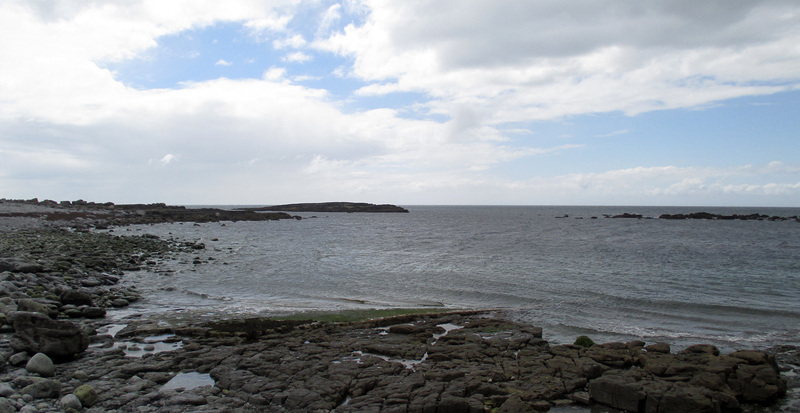 There have been arguments about which side of Inishmore is rockier, but Michael says that a trip to this bit of coastline proves hands down that the west wins (if you'd call that a win). 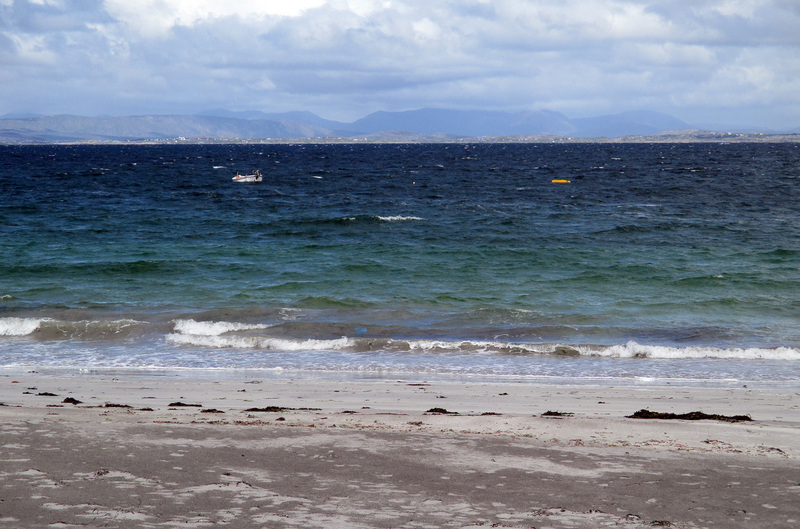 Near that beach was a pretty beaten-up fishing boat called a currach - how you face that sea in one of these little guys is beyond me! The second beach is quite nice indeed - again, in a rough and rugged way. Kilmurvey Beach it's called, and although it was only in the mid-50s with a good wind blowing - note that the sea is getting choppy - one young woman was determined to get her feet wet, and aye, bedad - she did! 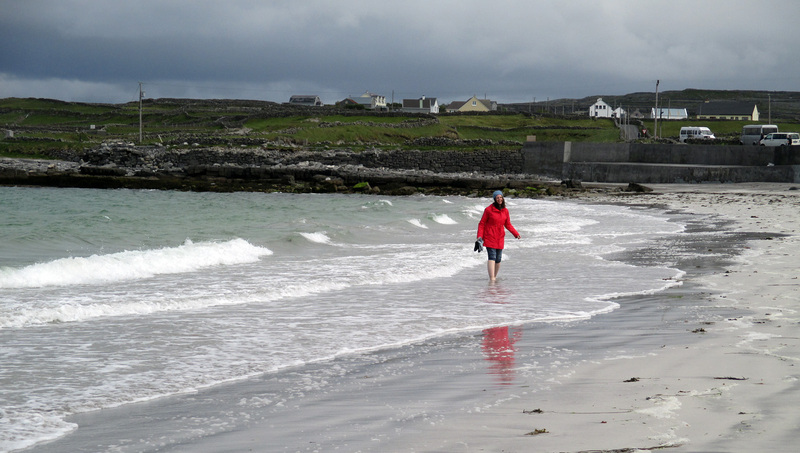 The young woman who got her feet wet - brrr! Kilmurvey was our last stop, as we had to be sure we were on time to catch the ferry home. We had about 20 minutes to look around at still more souvenir shops. I saw a lone fellow singing outside, into the wind - loud and strong too - I threw a few coins into his guitar box - brave soul, singing his way through Inishmore. What a place! I loved it, almost wish I'd figured out how to spend the night...or did I? 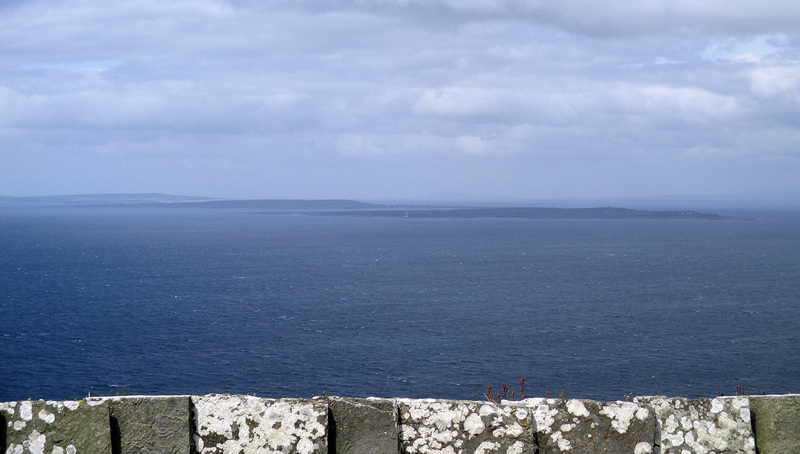 The buffeting I received atop Dun Aengus was coming back into mind...perhaps I'm not the Man of Aran after all. 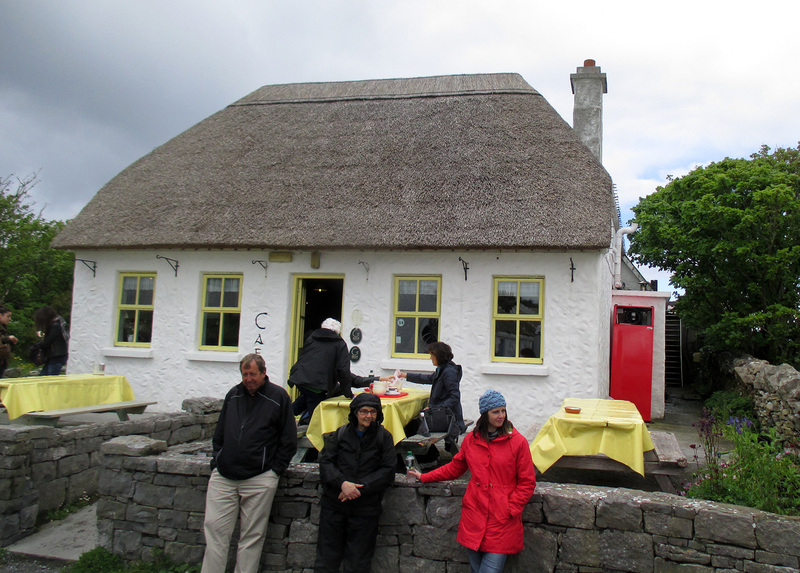 But I am so glad I included it on my Irish Itinerary. 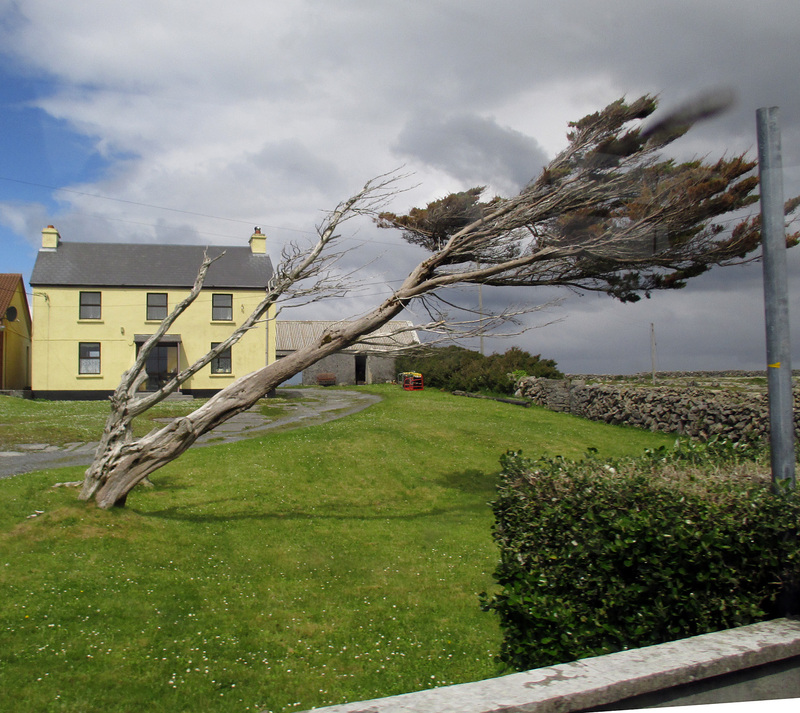 This tree is, for me, THE symbol of Inishmore - blown about, buffeted, it is bent but still it stands! 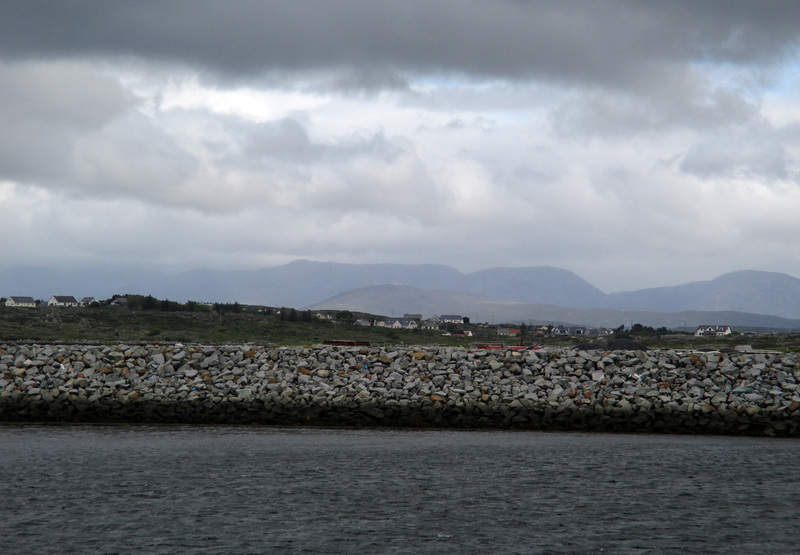 The ferry ride back was really rocky, as the sea had indeed got rougher, but as in heading to Inishmore we made it, and it wasn't too long before Michael dropped us back in Galway. He pulled into one stop just at the end of the pedestrian zone, and I thought, why go to the hotel just yet? I hopped out there, tipping him well, thanking him profusely for one grand day. 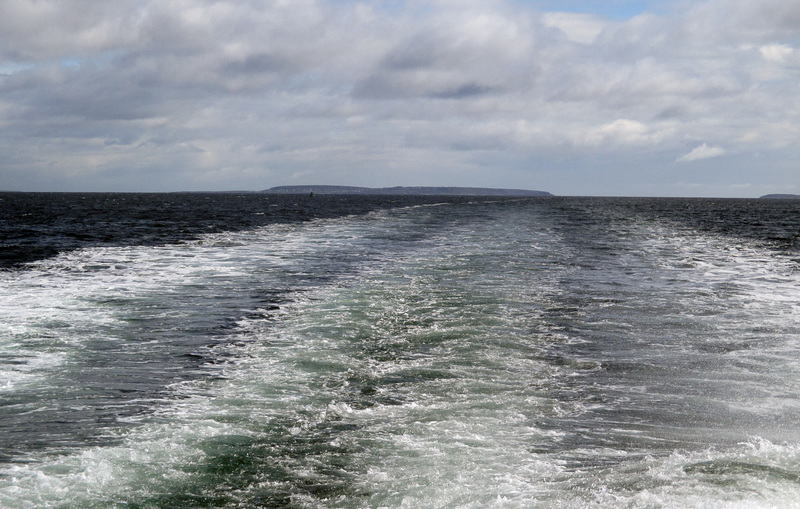 I took a photo of us leaving Inishmore behind, as I had of us leaving the mainland behind - a lot to see in a matter of hours, and see a lot we did! 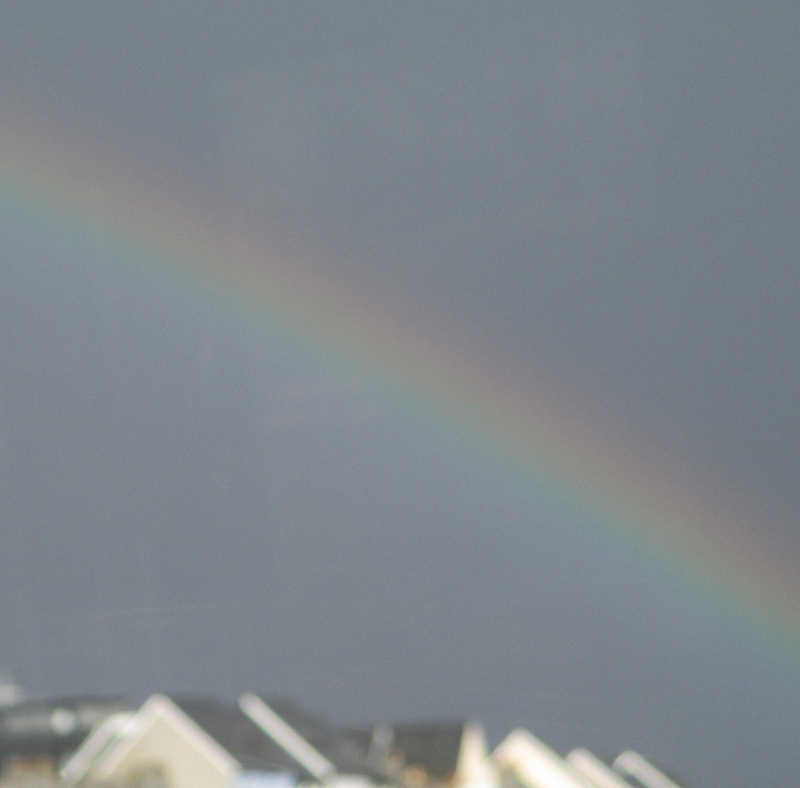 As we were pulling into Galway a rainbow appeared - no, it wasn't Finian's but a lot of us did "look to the rainbow" and I got a lucky photo of it (not a very good photo, but I'm showing it anyway) through the bus window. I knew that, while I'd had a very substantial luncheon of that wonderful Guinness beef stew I'd need something to eat this evening as well - but light! Light, please...so I began looking for dinner salads on the many menus available along the pedestrian zone. Most of the ones I found seemed more substantial than I'd need or want, but then I found one with a "traditional Caesar salad." I'd barely given the place a glance, as its name was Fat Freddy's (hmmm...foreshadowing) but my server was kind (and pretty - another tall blonde - do they GROW them in Ireland?). I ordered a glass of pinot grigio and the salad, and the salad arrived...but, but...sputter, sputter! It was topped, and I mean heavily topped - heaped - with bacon! Fortunately that was relatively easy to scrape off, and there was chicken breast beneath it all, and even some Romaine lettuce - the chicken was fine, the Romaine appropriate...but the Caesar dressing...well, let's just say it was...as expected, given the bacon mound atop the salad. But it was about the amount of food I needed and it was green...ish. Another evening stroll through the pedestrian zone, another pint of beer and crisps to get me through the night in hotel hell, and that's the end of my amazing day on Inishmore! 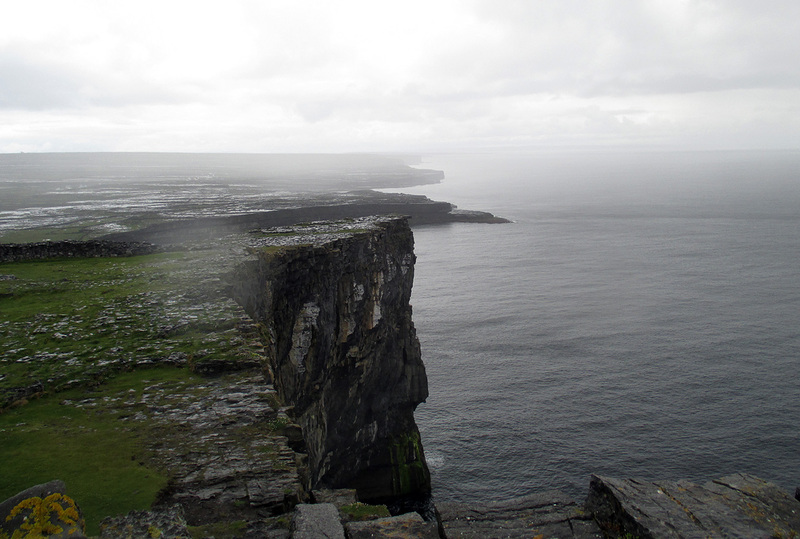 And the next blog post is about the next day of my running around Ireland - in the Burren and on the Cliffs of Moher!